A sign outside Notre Dame Junior/Senior High School reminded students to buy their yearbook. Look for a splashy page on the Sept. 29 event featuring big benefactors and the bright new building on campus. The ribbon-cutting for the $4 million Monsignor Francis J. Willenburg Center offered a look at the basketball court, which features six retractable backboards and a rubberized vinyl floor that looks like wood with a subtle pebbled effect; bleachers; and the stage where musicians and actors will put on blockbusters. The Utica community is also invited to use the space. “It’s very multipurpose: a basketball court, a drill deck, and it’s a good stage,” summarized the uniformed Vincent DeStefano, a Notre Dame junior and a Naval Junior Reserve Officer Training Corps member who was greeting arrivals for the ceremony. An actor himself, DeStefano looks forward to the stage shows. Bishop Robert J. Cunningham, expressing his hope for continued support of Catholic education, conferred his special blessing. “Whenever Catholic education grows, we’re excited about it,” Bishop Cunningham said after the ribbon-cutting. “And this is a further sign of the growth of Catholic education in the Utica area. We’ve provided a wonderful facility — due to the generosity of so many people — that our young people will be enjoying for a long time to come. “And having it named for Monsignor Willenburg, who spent his entire priesthood here, is a great, great gift. Monsignor Willenburg was well known in the area for his works of charity for both the young and the old. “When the groundbreaking took place [in May 2016],” Syracuse Diocese Superintendent of Schools William W. Crist said, “Bishop was celebrating the fact that in his years as being a bishop, this was really the first and only time that new [school] construction was taking place. So as we look through the windows and see the beautiful facility that we have here, it really does help to transform education in the diocese and specifically in Utica Notre Dame. Ronald R. Spadafora Jr., executive principal of Notre Dame Schools, told the attendees of the day’s luncheon that he just started at Notre Dame in July. “This is wonderful, and to have this facility as part of my entry into the school is a bonus,” he said. In the past, Notre Dame Junior/Senior High band members practiced in a small room. Also, athletic practices ran into the late night because they had to be held “back to back to back to back” in the school’s main gym, with its shiny hardwood floor. Now, some of the teams will practice in the Willenburg Center, allowing the students to get home and finish their homework. Jim Joseph, president of the board of Utica Notre Dame and also dean of the Le Moyne College Madden School of Business, said he has been playing a little game at the Willenburg Center. “We’re just coming off an extraordinarily successful capital campaign where we hit our number: $8 million,” he added. “Four million of that built the building we’re standing in. Four million of that will be an endowment forever and will kick off hundreds of thousands of dollars for scholarships for our students. “The raising of money beyond the $4 million for the endowment will never end. 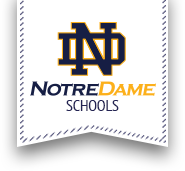 We hope to build an endowment the same size as some of the other Catholic schools in Syracuse.” Contributors can donate at notredameutica.org. The Willenburg Center, with its huge windows that enhance the bright feeling, is 100 percent paid for, no debt, Joseph said, “thanks to the incredible generosity of the alumni of Utica Notre Dame. We are eternally grateful. Joseph said 34 students in Notre Dame Schools have received Darby Scholarships this year. “We estimate about half of those students wouldn’t be here without that scholarship, so that’s transformative,” he said. About 10 members of the Darby family attended, including Dorothy’s son Terence Darby, and his wife, Anna Darby-Matteoda, of Yardley, Pa.
Offering thank-yous to the more than 100 people who attended was Msgr. Willenburg’s nephew Msgr. Robert F. Morris, vicar general of the Diocese of St. Petersburg, Fla.
Msgr. Morris recalled that his uncle was a great athlete who played for one of Niagara University’s more memorable basketball teams in the 1950s. Msgr. Morris also cited his uncle’s love for families and education. “It’s a great day to be a Notre Dame person,” Joseph said.